Tell ya one thing I will look back at: the year in this blog. Here are the entries that generated the most interest. Coming in at number one are the posts I’m most proud of, namely my coverage of Noir City Seattle in July. Every night for a week I’d see a double feature of classic noir, then come home and write the films up. I never miss a chance to work on deadline. The Noir City posts are here and here, with a brief follow-up. I hope I get a chance to do it again in 2008. An appreciation of Glenn Ford and The Money Trap. And of course, my tribute to Steven Seagal. But what drove the most traffic to this site? Amidst the thousands of words I cranked out in 2007, what served as the brightest beacon on the rough seas of the internet? 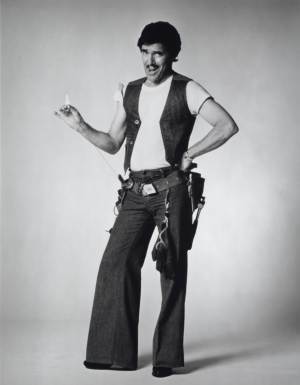 This photo of Pat Harrington as Dwayne F. Schneider on One Day At A Time.